This dish takes a fair bit of time to make, but it’s one of my favorites for a hearty meal to serve to company. I’ve been making it for a while but it wasn’t until recently when I made it for friends in Canada that I took pictures. Their version was already vegan but not gluten-free. The book has some fabulous recipes but not ones designed for quick meal prep. Their version used a blender, food processor, skillet, pot, and several bowls. I replaced the seitain with tofu to eliminate use of the food processor (and because seitain is wheat gluten). I also made a few other changes here and there to save time and for personal taste or ingredient availability. I almost always double the recipe, so I provide both sets of measurements here. Start soaking the beans the night before or early morning the day you are making this recipe. If you don’t have time, try to soak them for an hour and then pressure cook them. After soaking (6-8 hours or more is best), drain out the water and use fresh water for cooking. Any combination of beans will do. Kornfeld and Minot like anasazi (picture), but they aren’t exactly supermarket beans. I like adzuki and black beans, but I’ve used a variety of different kinds. If you use canned or pre-cooked, double or triple the amount and measure the beans drained. The amount isn’t critical. 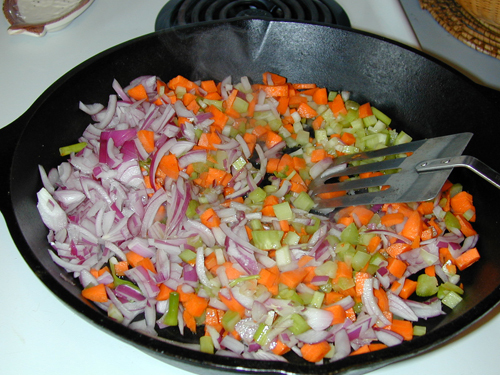 For the veggies, chop them fine and use any combination that you have on hand that you like. The original recipe calls for lots of garlic which I leave out, as I’m not fond of it. But you can include as much as you want. I’ve made this recipe many times with no onion or garlic and it’s delicious. Just be sure to use more than one (3 is good) vegetable. Put them in a large measuring cup as you cut them. If you end up with too many of one, transfer them to a bag or container and refrigerate or freeze for your next saute or soup. I use fresh oregano since that’s what I have on hand. 1 teaspoon dried is about equivalent to 1 tablespoon fresh. If you prefer different spices, use them instead. Kornfeld and Minot are real big on their chili varieties (it’s actually a complaint about their book) but it’s not necessary to use them all. Just throw in what you have and like. Whole, flakes, powder. I left out the chili in the cornbread. The original recipe calls for dry sun-dried tomatoes but I use olive oil packed ones instead. 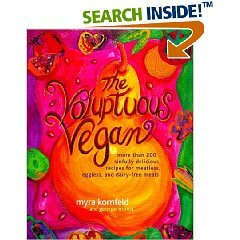 If you don’t want tofu, you can use tempeh, or seitain (wheat gluten), which is what the original recipe called for. Or you could even use browned ground meat. Or leave it out entirely and just make the chili thicker. 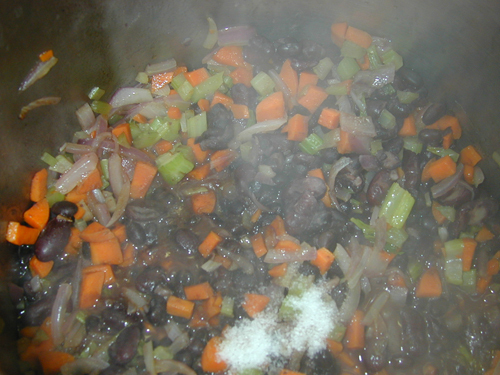 Cover the beans with 7 cups water and simmer until tender (about an hour, sometimes two). Add salt to taste after they are done. If you are using whole chilies, remove the stems and seeds and soak them in boiled water for 15 minutes. If you are using dry tomatoes, add them as well. Saute the vegetables in olive oil on medium-low heat for about 10 minutes, stir often. Add the herbs and cook for another 5 minutes. Put the chilies and tomatoes, along with the soaking water, into a blender and process until smooth. If you need more liquid, use the rice wine and/or lemon juice. 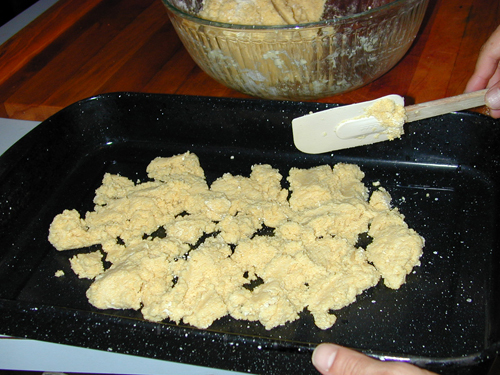 Crumble the tofu with your hands into small bits. Put the tofu in a pan with the chili-tomato puree and cook for 5 minutes, stirring constantly. If your beans have excess water, pull it out with a cup. Add the tofu to the beans. Add the rice wine and lemon juice, if you haven’t already. Simmer the beans for 15-20 minutes as needed to thicken. Add back some of the bean water if it gets too thick. You want the beans to be pourable but thick enough to stay on a large spoon. The original recipe called for wheat flour with the cornmeal but I changed it to be gluten-free. If you don’t want the soy, go ahead and use twice as much brown rice flour (or white) or sub the gluten-free flour of your choice. I use soy to boost the protein content and lower the carbs. The xanthan gum is needed to help the gluten-free flours rise. You can use guar gum instead but I’ve never tried it. If you’re not gluten-free, you can use wheat flour and drop the gum. 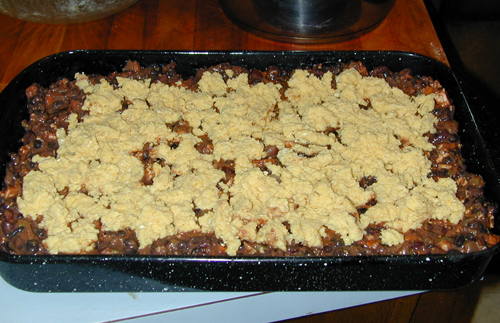 Preheat the oven to 350*F. Lightly oil a deep 7×9″ baking dish (for single recipe). Get out two bowls. One for dry and one for wet. Use the bigger one for dry and make that mix first. Note that you can make everything for this recipe well ahead of time except for mixing the wet and dry cornbread bowls together. That needs to be done at the last minute. In the larger bowl, mix the flour, cornmeal, baking soda, baking powder, and salt. In the other bowl, mix the vinegar, soy milk, oil, and water. Use a whisk to thoroughly blend and emulsify (or use the blender). Add the wet ingredients to the dry ingredients and mix together with a spatula just until the ingredients are fully moist, but do not over-mix. Spread a thin layer of batter on the bottom of the baking dish. Sometimes it spreads better than other times. You can add a bit of water if you wish, but don’t overdo it and don’t mix too much. 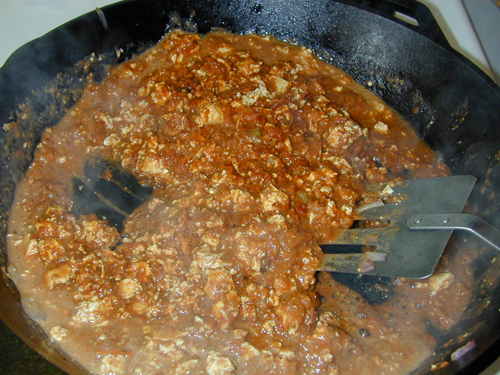 Pour the chili on top, even it out, then add the rest of the batter, getting it as even as possible. I was a bit tired and rushed when I made it this time. I really should have added more water to thin out the batter. But the dish was still quite good when it was done. The original recipe calls for 45 minutes of baking. But I never found this to be enough, especially not when I double the recipe. Check it after 45 minutes but pull it out when the cornbread on top is lightly browned and no longer has a raw taste. 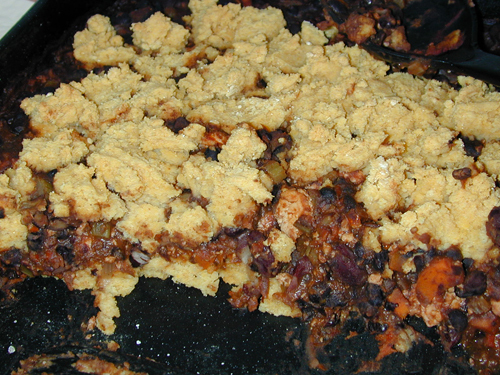 Give the casserole at least 5 minutes to cool before cutting. This is delicious served with a chopped/sliced lettuce salad with a tangy vinaigrette. Or with any other raw salad of your choice. Also with salsa or guacamole.